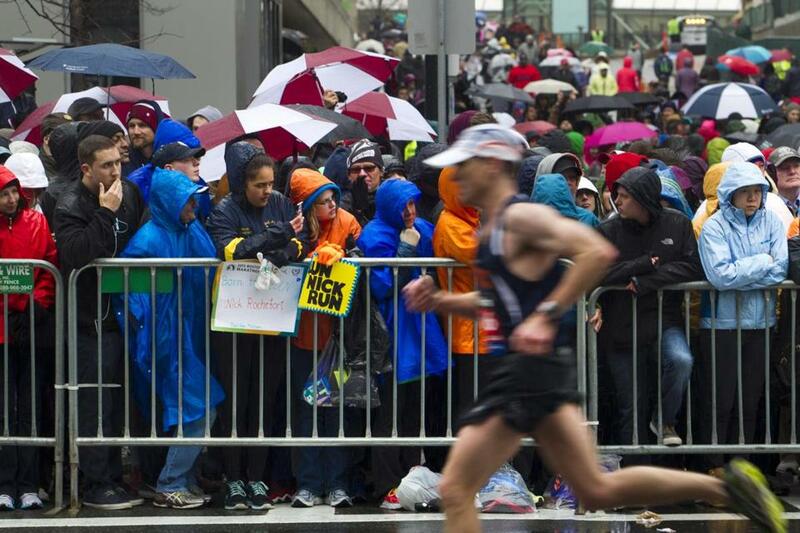 Soaked spectators lined a rainy, cold Boylston Street in Boston near the Marathon finish line last year. Authorities said Wednesday that security will remain tight for the 120th running of the Boston Marathon on April 18, but they assured the public they know of no specific threat to public safety. “There is no articulable or credible threat to this date,” said Harold Shaw, special agent in charge of the FBI Boston division. At a news conference in Boston, law enforcement authorities outlined security preparations for the upcoming race. The plan, six months in the making, will involve nearly 5,000 federal, state and local law enforcement officers, who will patrol the 26.2-mile route by land and air. “I feel strongly that we have a well thought out plan, which will continue to be updated as needed, as the race day approaches,” Shaw said. Authorities have ramped up security at the world-renowned race since the 2013 Marathon bombings, which killed three spectators and wounded more than 260 others. In crafting a security plan for tens of thousands of runners and spectators, authorities analyzed terrorist attacks in Paris, San Bernardino, Calif., and Brussels in recent months. “All of us have carefully assessed, looked at, and learned the lessons of what has gone on,” said Kurt Schwartz, director of the Massachusetts Emergency Management Agency. Officials have prepared for a number of potential security threats, such as an active shooter or a suicide bomber, Shaw said. “These are all things we have gleaned from the Parisians, the Belgians, and our own field office in [Los Angeles],” Shaw said. Authorities also plan to monitor social media closely in hopes of heading off any attack, Shaw said. On race day, the State Police Air Wing will fly over the course, while law enforcement officers — both in uniform and plainclothes — will be on patrol. Security cameras will be positioned along the way, officials said. “The security of the race route is our priority,” said State Police Colonel Richard McKeown. The course winds through eight communities, from Hopkinton to the finish line in Boston. The Boston Police Department will also have a full complement of officers on hand, said Deputy Superintendent Bill Ridge, who urged spectators to attend the race. Spectators can expect to encounter a number of security checkpoints along the course, particularly in Hopkinton and Boston. As in past years, backpacks, suitcases, large blankets, coolers, and glass containers are among the items that are not allowed along the route. Drones are also banned, authorities said. Authorities also asked spectators to be vigilant and report any suspicious activity to police. “We ask the public’s help to be our eyes and ears,” said MBTA Police Chief Kenneth Green. Kathy McCabe can be reached at Katherine.McCabe@globe.com. Follow her on Twitter @GlobeKMcCabe.